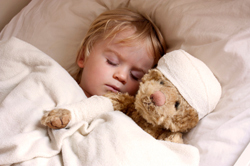 Injuries to children, which give rise to legal claims, may result from auto accidents, pedestrian and bicycle accidents, dog bites, premises liability, medical malpractice, products liability, lead poisoning, sexual abuse, sports-related injuries, burns, and other accidents. Sometimes a claim may arise due to inadequate supervision. Parents and families who are caring for an injured child, or who have suffered the loss of a child, face an enormous burden. As a lawyer and father, I know that when a family places their trust in me, the important task of seeking justice for their child is an awesome responsibility. I know that I must commit all of my skills and experience as a litigator to seek a meaningful result that will help compensate for the harm caused by a profound injury, or give comfort to a grieving family for their loss. Car accident, injury to minor, bone fractures. DuPage County, Illinois. Settlement for $250,000 was reached on behalf of an injured minor, who suffered multiple displaced fractures in her right arm, requiring an open reduction and internal fixation of the right radius and ulnar bone, and a closed reduction internal fixation of the right distal radius. The minor was a passenger involved in a rear-end-type automobile accident. (No lawsuit filed). When a child is injured due to an accident, a parent or guardians of the minor (a child under the age of 18) can bring a claim or lawsuit on behalf of the injured child. Money damages obtained through settlement, or as a result of a jury verdict, is held in “trust” to benefit the child and will be used for the child’s health, education, and welfare, including the child’s past, present, and future medical costs, which may be substantial. Often, money obtained for an injured child can serve to benefit the child throughout his or her life. In some instances, structured settlements can be obtained which allow the child to receive income through an annuity for years to come. Wrongful death, car accident/truck accident, negligence, governmental tort immunity. Will County, Illinois. A settlement totaling $1,520,000 was reached by attorney John J. Malm in a wrongful death lawsuit filed by the family of a 7-year-old girl who died as a result of injuries she suffered in a traffic accident at an uncontrolled intersection in suburban Will County. The lawsuit was settled shortly before jury selection was to set to begin in the trial against a suburban township in Will County and against a propane company which operated a truck involved in the crash. The young girl was a passenger in a car was heading to a soccer game northbound on 88th Avenue near the intersection of Steunkel Road in Frankfort, Illinois when the car was struck in an intersection by a westbound propane truck. At the center of the lawsuit was an allegation of the township’s voluntary undertaking to inspect sight lines at the intersection, which were dangerously obstructed, according to the complaint. The township had argued it had no duty to install traffic control devices at the uncontrolled intersection, and was not obligated to address sight-line issues. The court denied the township’s numerous motions to dismiss the complaint, allowing the case to go to trial. In the tragic event of a child’s death, parents and famialy members may have legal rights under the Illinois Wrongful Death Act. A family member may be appointed as a representative to serve on behalf of the deceased child’s estate and to seek damages for the benefit of siblings, parents, and other family members. In cases of negligence, the Act allows the deceased child's family members to receive compensation for the loss of love and support (the loss of "society") that the child would have contributed to family members throughout his or her life. With recent changes in Illinois law, grieving family members may also have valuable claims for their emotional suffering due to loss. An experienced injury attorney can advise you and your family what damages may be recoverable, and how best to pursue your important claim. If you, or your family provide care for an injured child, or if you have suffered the loss of a child due to an accident or injury, I want to offer you a caring and compassionate approach to representing you and your family.